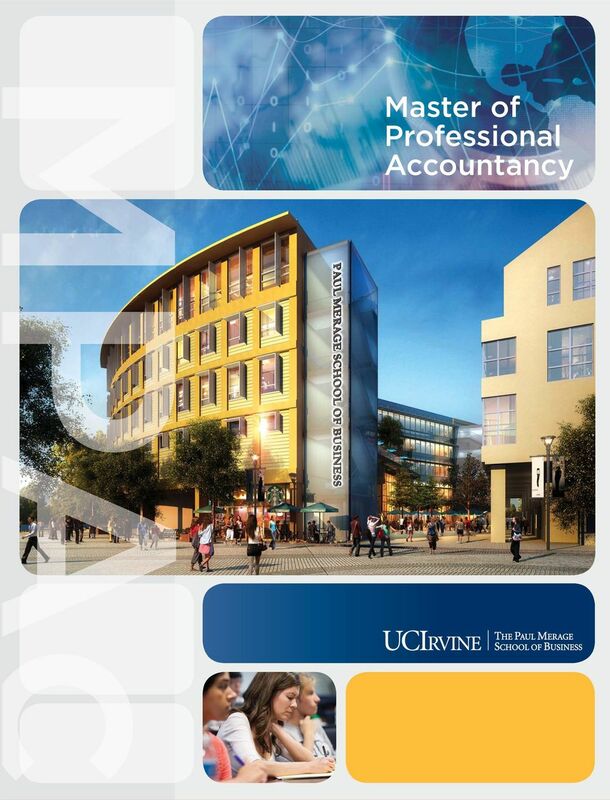 Download "Master of Professional Accountancy"
6 Life in the O.C. 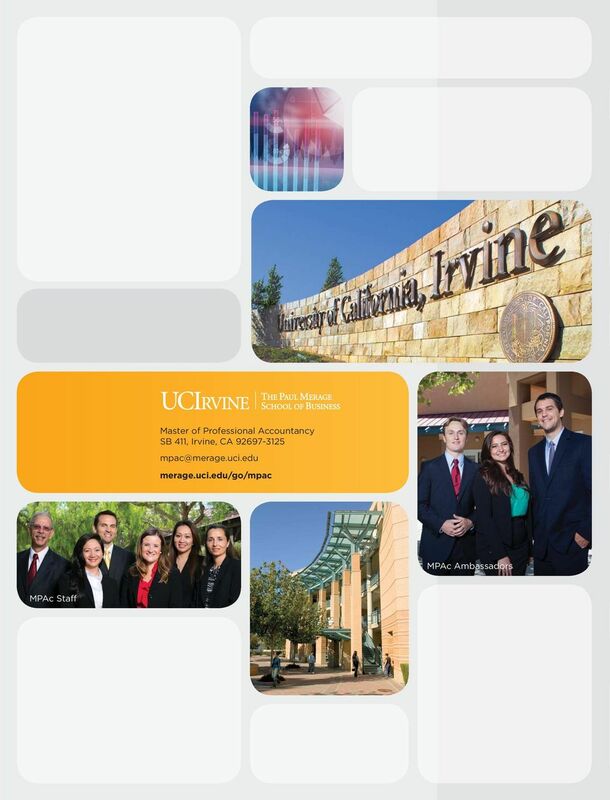 The University of California, Irvine Founded in 1965, the University of California, Irvine combines the strengths of a major research university with the bounty of an incomparable Southern California location. UC Irvine s unyielding commitment to rigorous academics, cutting-edge research, and leadership and character development makes the campus a driving force for innovation and discovery that serves our local, national and global communities in many ways. 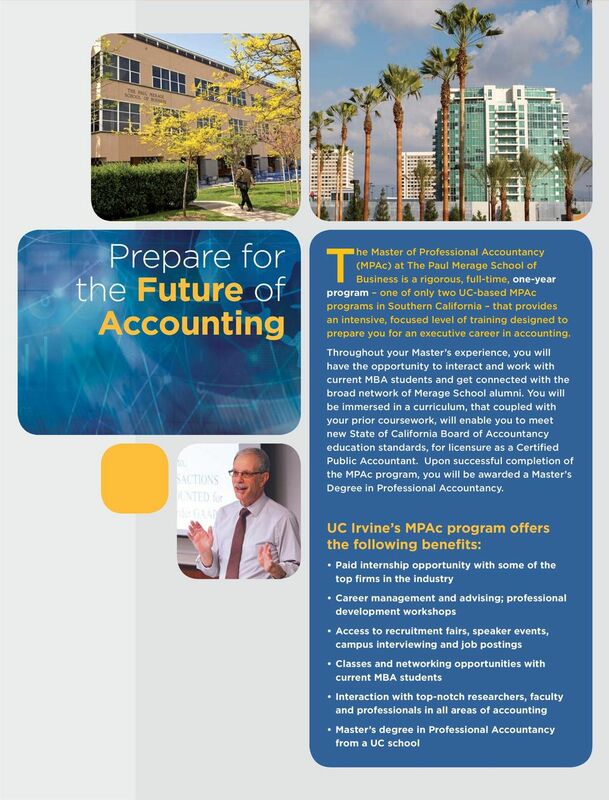 The Paul Merage School of Business at UC Irvine consistently ranks among the top 10% of business schools in the world. 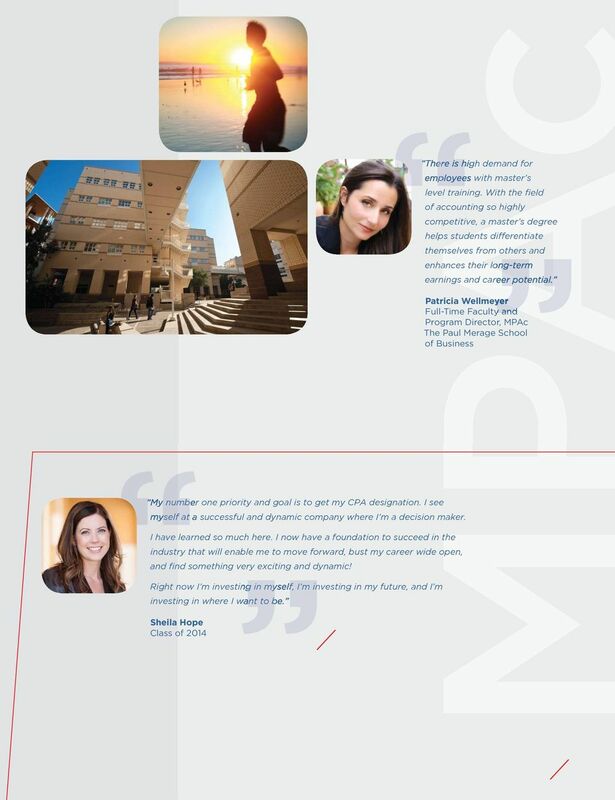 Our pioneering curriculum and dynamic network attract business leaders, the best and brightest students, and the global companies that recruit them. Our reputation includes accolades from BusinessWeek, U.S. News and World Report and the Financial Times. 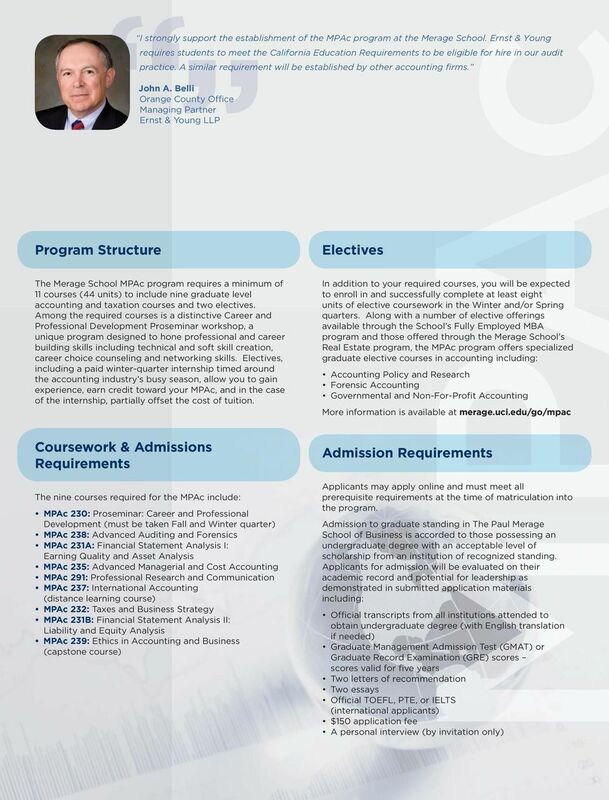 At the Merage School, you will build close relationships with a diverse group of students, receive personalized attention from faculty, and gain access to the Tech Coast s leading industries all as part of the prestigious University of California system. 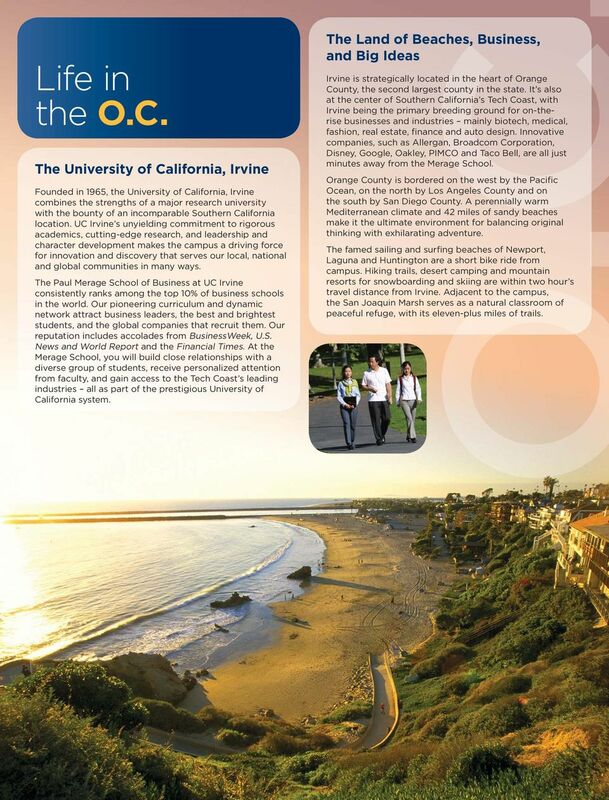 The Land of Beaches, Business, and Big Ideas Irvine is strategically located in the heart of Orange County, the second largest county in the state. It s also at the center of Southern California s Tech Coast, with Irvine being the primary breeding ground for on-therise businesses and industries mainly biotech, medical, fashion, real estate, finance and auto design. Innovative companies, such as Allergan, Broadcom Corporation, Disney, Google, Oakley, PIMCO and Taco Bell, are all just minutes away from the Merage School. Orange County is bordered on the west by the Pacific Ocean, on the north by Los Angeles County and on the south by San Diego County. A perennially warm Mediterranean climate and 42 miles of sandy beaches make it the ultimate environment for balancing original thinking with exhilarating adventure. The famed sailing and surfing beaches of Newport, Laguna and Huntington are a short bike ride from campus. Hiking trails, desert camping and mountain resorts for snowboarding and skiing are within two hour s travel distance from Irvine. Adjacent to the campus, the San Joaquin Marsh serves as a natural classroom of peaceful refuge, with its eleven-plus miles of trails. Master of Professional Accountancy. You ve mastered the fundamentals, now take your career to the next level. National Rankings AND RECOGNITION. Bloomberg Businessweek. Princeton Review. Hispanic Business. Since 2007 inaugural rankings. 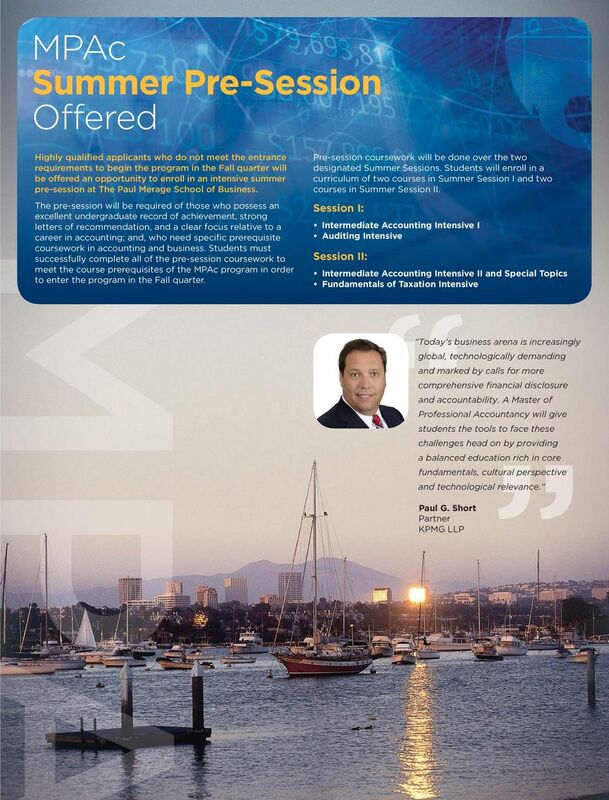 The accounting world is changing. Master of ACCOUNTANCY SAM M. WALTON COLLEGE OF BUSINESS AT THE UNIVERSITY OF ARK ANSAS The Master of Accountancy At the Walton College, we connect scholarship with practice and people to organizations. Part-time. mbs.edu. Designed for busy professionals GLOBAL. BUSINESS. LEADERS. Sacramento State College of Business Administration Master of Business Administration M a s t e r o f B u s i n e s s A d m i n i s t r at i o n www.cba.csus.edu/prospectivemba Leadership begins here. 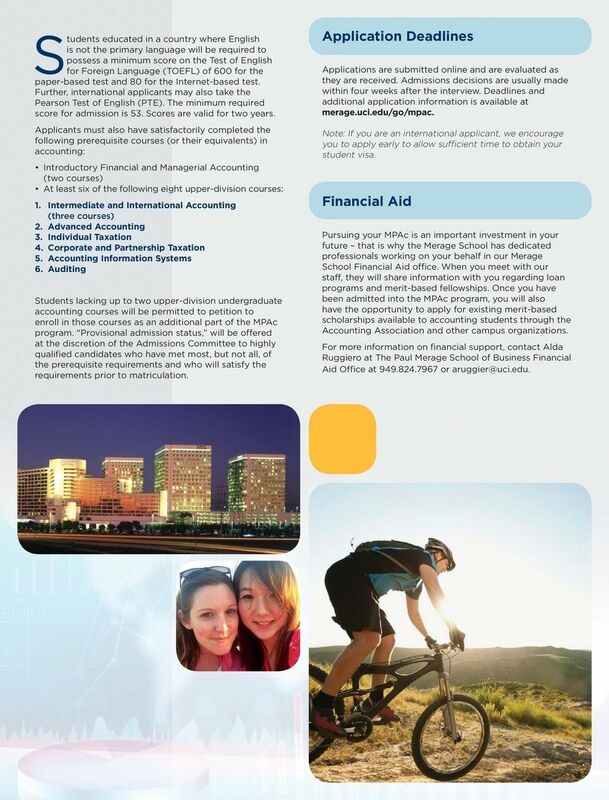 Admissions Will I qualify for admission with a three-year undergraduate degree? See how we think and do. Master of Arts in Human Resources and Industrial Relations. Developing Leaders. Advancing Careers.